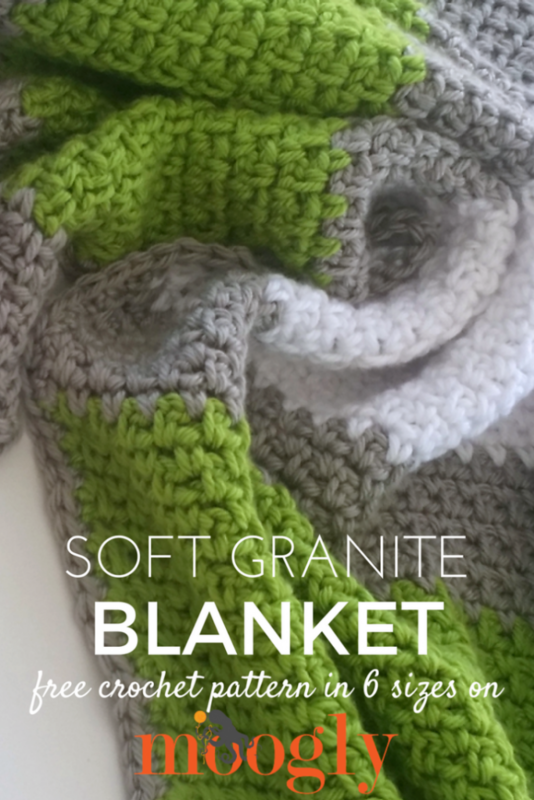 The Soft Granite Blanket is super easy to make – just chains and single crochets. And it features the moss stitch, aka the granite stitch (aka lots of names), which has a great look without being feminine or lacy. 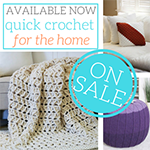 And with Lion Brand Hometown USA and a 15mm crochet hook, you can make all but the largest sizes in just one weekend! And bonus – this one features a bright spring green, perfect to celebrate the Pantone Color of the Year! It’s also ready to customize for your favorite sports team, or any home decor! The stitch multiple for this pattern is any multiple of 2. Using the gauge listed above, this chart should allow you to make this pattern in any size needed. 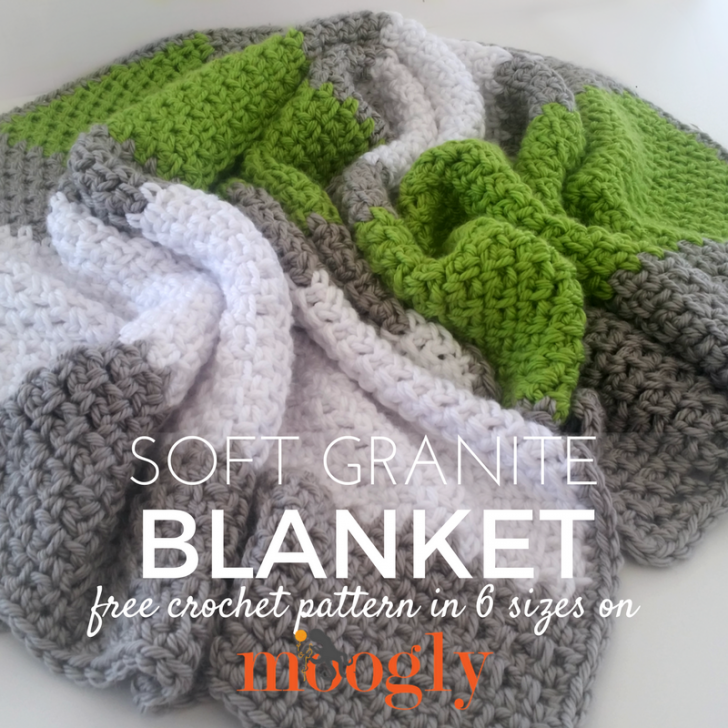 If there’s a size you need that isn’t listed here, then just chain an even number until you have the blanket width desired, and then work in pattern until you have the length desired. You can use the yardage listed below as a guideline to help estimate the amount of yarn needed. 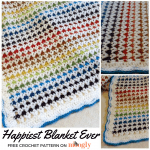 The yardage is listed for the total blanket, with the estimates per color for a 3 color blanket in parentheses – this assumes a similar layout to the one pictured and listed below in the instructions. Row 1: With Color A, ch the number based on chart above, skip 3 chains, sc in the next ch, *ch 1, skip next ch, sc in next ch; repeat from * to end, turn. Row 2: Ch 2, skip the 1st st, sc in the next ch sp, *ch 1, skip the next st, sc in the next ch sp; repeat from * to end, turn. 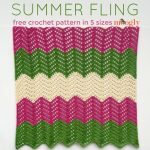 For other sizes, to plan your own rows following this color scheme, work your rows in the following order (percentage listed is the approximate percentage of total rows – adjust as desired to fit your blanket size): 10% Color A, 16% Color B, 7% Color A, 13% Color C, 8% Color A, 13% Color B, 7% Color A, 16% Color C, and 10% Color A. For the sizes given above, the color scheme is provided below. Border: Break all yarn except for border color, then sc evenly around blanket, working 3 sc in each corner st.
And that’s that! 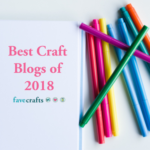 Crazy simple, but so satisfying to crochet, and the result is perfect for any recipient and any decor! 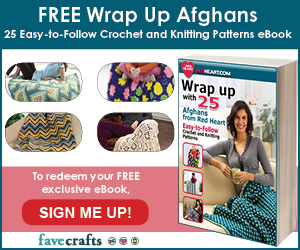 It’s easy to memorize, and great to crochet whenever you need a fast afghan. 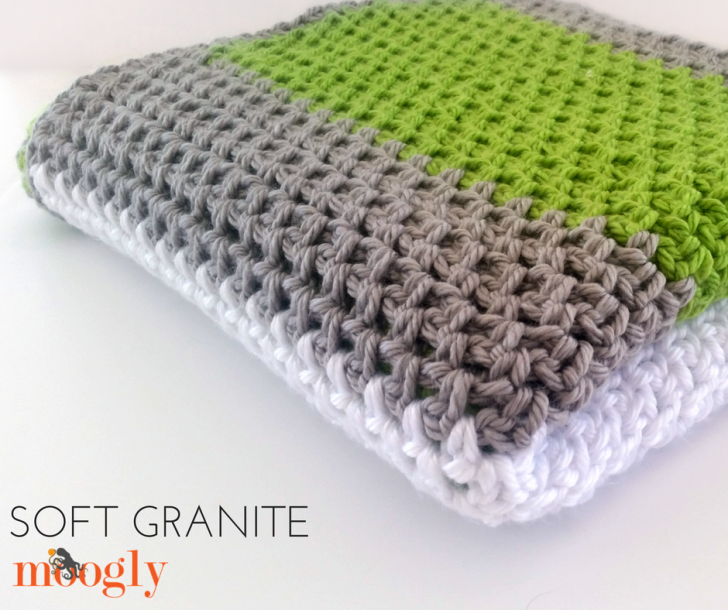 I hope you’ve enjoyed making the Soft Granite Blanket – I can’t wait to see what color schemes you all come up with! 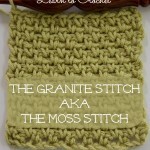 I’ve used this stitch many times before, but never with such large yarn & hook and never on such a large scale. Thanks for doing all the math for us all!! I’m really confused about the larger hook sizes. This calls for US-P/Q, 15mm hook but at the store the size P hooks I found say they are 10mm or 11.5mm and Q is 15.75mm. Lion Brand has a Q-19 that is 15.75mm What happened to hook sizes being standardized? Thank you for advice. The first one needs to be done in shades of gray. I will see what Lion Brand has. Printer friendly link doesn’t work. It’s 11 pages if I print out as is. 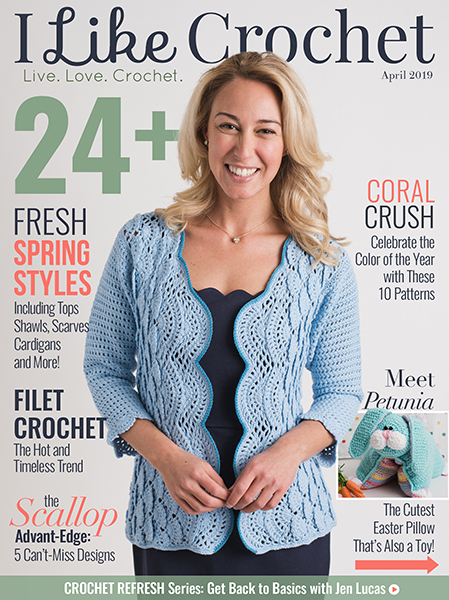 I saved to my Ravelry Queue and looked to see if there was another print version there. No luck. I’m not very computer literate. Can you help me? Thanks. Hi Rhonda! After you click the Print Friendly button and it creates the popup, you can click on the parts of the post that you don’t want/need to print, like extra photos and the “talky” bits, and any ads that didn’t get taken out automatically. That should shorten the printout quite a bit! Thank you so much. I’ll try that! I have been looking for a simple pattern to use up my scrap yarn/leftover yarn. I have a friend who seems to be cold all the time so this will work for him. Thank you for the easy instructions. 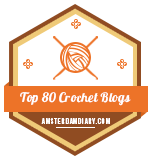 Going to use a smaller crochet hook as the yarn I have is worsted weight..
😀 Thank you so much Cheryl! I have been looking for a quick blanket to make for my 3 year old grandson to match the quilt i made for him. This will be a great relaxing choice. I will be using worsted weight yarn and will try to modify the pattern, unless of course you have a suggestion? Thank you so much! have been looking for something that would be quick. i tend to get bored with the same stitches all the time and always looking for something different to do. thank you! 🙂 I hope this works for you! What does this mean? “Break all yarn”? It’s just another way of saying to cut the yarn (leaving a tail to weave in of course). We’re done with those colors, and ready to make the border, so there’s no reason to leave the other colors attached anymore. I have knitted since I was a child just starting to crochet and thought this would be a great start pattern. Love the colors shown. Super late, but does the size of the yarn matter? Would variegated yarn be ok to use? And what hook size should I use if I hold 2 strands of worsted yarn together? This is my first project with super bulky yarn — I love the Hometown and look forward to using it for other projects. But I just joined the new skein mid row and carried the tails behind the stitches. like I’ve done for other projects. But for this bulky yarn with the stitches spaced so far apart, this doesn’t seem like a good way to join. What method do you recommend for where and how to join a new skein? Thanks! I used the fisherman’s knot. No ends to weave in! Thanks, Jinx! The video was very helpful. I’ll give this a shot. Hi Loyal Dinosaur (great screen name)! I’m a big believer in weaving in ends, and the granite stitch is close enough (aka not lacy) that it usually works pretty well. However, the big bulky yarns do like to be a little more obvious! It can help (if your ends work out the right way) to switch skeins along the sides, when moving to a new row. Then all the ends can get woven into/covered by the border. There’s also the Russian join technique, and other “knot” technqiues, but frankly, I just don’t trust them as much as weaving in ends. This pattern is beautiful and a perfect last gift for my oldest son. Only problem is that I cannot crochet. Is this pattern available in the knitted version? I thought I saw a pattern for a matching elephant lovey but I can’t seem to find it. Is it still available? 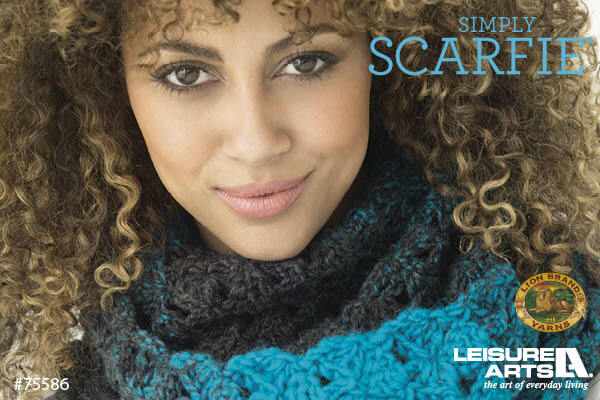 I would like to do this stitch with a caron cakes yarn. What size hook would you recommend with that size yarn? 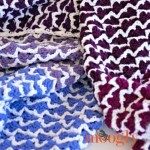 I’m not good at math.I would like to make the queen blanket using 10mm hook?Could you tell me how many I need to chain. 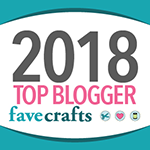 Thank you.I ordered all the yarn and 15mm nettle that your pattern called for but thought the15 was larger than I wanted.I will try the long chain. Hello. Thank you so much for the wonderful pattern. I’m making a blanket for my baby boy. I’m pretty new at crocheting and wanted to ask for your help, better explanation, instructions of how to make border after I’m done with all the rows. Thank you so much! I guess my question was what color yarn to use for the border? I know I’m a bit late to this party ;), but I’m fairly new to crocheting, and I wonder if I’m figuring out how much yarn to get correctly: If I make the twin size blanket with the suggested yarn, I’d need 3260 yds. of yarn altogether. The Hometown USA yarn is about 64 yds. per skein, so I’d need to buy 51 skeins altogether? Am I correct? Hi Deborah! Yes, you have it correct. Though I’d recommend getting 52 just in case!